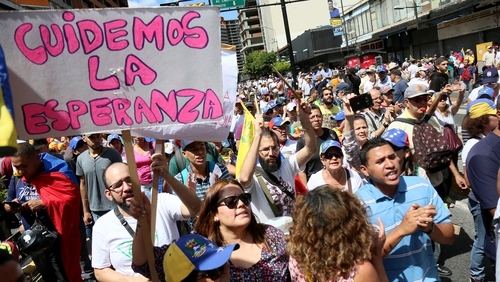 Venezuelan opposition leader Juan Guaido has told a huge rally of supporters that humanitarian aid would enter the country on Saturday 23 February, setting the stage for a showdown with President Nicolas Maduro who has refused to let supplies in. Tens of thousands of Venezuelans protested nationwide today to demand that Mr Maduro allow aid into the country, where food and medicine shortages are rife. Mr Guaido invoked a constitutional provision to assume the presidency three weeks ago, arguing that President Maduro's re-election last year was a sham. Most Western countries, including the United States, have recognized Mr Guaido as Venezuela's legitimate president, but Mr Maduro retains the backing of Russia and China as well as control of state institutions including the military. A Venezuelan opposition envoy has also said that Brazil's government would try to get humanitarian aid to the border. President Maduro has denounced the aid as a US-orchestrated show to overthrow his socialist government and said it will not be let into the country. He has demanded instead that Washington lift economic sanctions. Today, Mr Guaido said he was issuing a "direct order" to the armed forces to allow the aid in, though so far there are no clear signs the military will disobey Mr Maduro. He did not specify from where aid would enter, but said the opposition would go in a convoy to safeguard the supplies. "Put yourselves on the side of the constitution, but also on the side of humanity," Mr Guaido said, in a message directed at the military. "February 23 will be the day for the humanitarian aid to enter Venezuela, so from today we will have to get organised." Mr Maduro, in an interview with the BBC, said Venezuela was "not a country of famine" and did not need aid. "The Ku Klux Klan governing the White House today wants to take possession of Venezuela," he said. "In the west, Venezuela's situation is distorted to justify any sort of intervention." Mr Guaido, who has galvanised the opposition after several years of in-fighting and government crackdowns, vows to keep calling protests to pressure President Maduro to step down so new presidential elections can be held. Yesterday, Mr Guaido announced the first delivery of humanitarian aid, including vitamin and nutritional supplements for children and pregnant women, to a network of health centres. He did not explain how it had entered the country and said it was a small-scale donation. On Venezuela's border with Colombia, smaller opposition protests formed. In the town of Urena, several hundred people dressed in white danced in the streets, waving flags and chanting profanities against top government officials. "We want a prosperous Venezuela, as it was before," said Mery Marin, a 25-year-old electrician. She said most young people from Urena had emigrated to escape the crisis. The ruling Socialists, who have been in power for two decades, rallied in the capital Caracas to "demand respect for the country's sovereignty." A few thousand people gathered, including many state employees, holding "Defend the Country" banners. Mr Maduro's adversaries say he has run roughshod over democratic institutions and ravaged the nation's economy through nationalisations and a corruption-riddled exchange control system. President Maduro counters that he is victim of an "economic war".